Between 1941 and 1944 people did not come to Alliance House to learn French as they do today; they came to work hard at defending France, liberty and democratic values. They spoke French, smoked Gauloises, stuck drawing pins in maps of France and planned dangerous missions behind enemy lines, for they were the staff of SOE’s RF section. The men and women who worked at Alliance House were between 20 and 50 years old and came from many different backgrounds. They were British, from England, Scotland, Canada, New Zealand; some with roots or links in South Africa, Jamaica, Turkey, Portugal, Poland. Several had French mothers or had been born in France. In 1943 American colleagues joined them. They all spoke French, and for a while spoke to each other only in French, so as to be prepared if they too were needed to be parachuted onto French soil to take part in her liberation. Kay Moore was one such dedicated staff officer. “un chic type!”, “silly sausage!”, “very handsome”... This is how Kay, over 60 years after, described some of the SOE and Free French men she worked with. But it was a dashing Free French officer with an already impressive war and resistance record that she fell in love with. 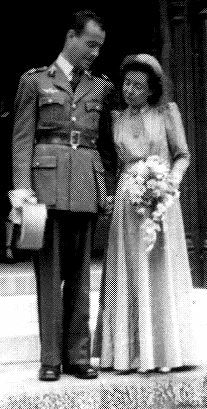 Our research has established that Kay and Charles met at 1 Dorset Square, unbeknownst to their children, which is not entirely surprising as this is typical of people involved in the war to wish to move on after 1945 and start a new chapter in their lives. But for Kay, as for many others, the war years remained special in her heart for their intensity. She left France in a hurry in May 1940. Once in London, Kay held two jobs before joining SOE. She worked at the War Office, employed by MI5, then at Canada House, “coding and deciphering”, and as an official there wrote, “doing confidential work in our Cypher and De-cypher Department, where discretion, accuracy and industry are required. It gives me great pleasure to say that she has shown all these qualities while she has been with us.” She started work for SOE on 1st April 1941. Once in place, Kay, ever the organiser, got her Paris colleague and friend Mary a job in the Firm, and arranged for them and another girl working for MI5 to share a townhouse in Knightsbridge. 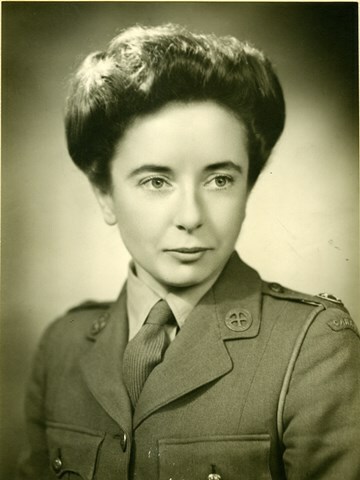 In the Autumn of 1944 she was sent to Paris with the rank of Commander (equivalent to the rank of Major in the Army, but rare for a woman) and “[...] she managed by working until the early hours of the morning to help in the liquidation of the old wireless réseaux where her personal knowledge of the men who had been employed in this work was invaluable.” She left SOE on 22 August 1945 and married a week later. Part of Kay’s job, like all RF staff, was to ease the agents’ pre-mission jitters, by making them laugh and lots of cups of tea. Her sunny personality was such that she knew everybody and everything in the organisation, was in contact with many agents and other exiles, and parties at her home (unbeknownst to SOE) were famous among them. She was close to a number of them but when she met Ernest Gimpel, it was love at first sight. The coup de foudre happened at 1 Dorset Square, as she was giving his codes to this dashing cavalry officer, now Charles Beauchamp, a special agent. They dated and got engaged before he left. Initially, for some reason, Kay thought that he was a Frenchman teaching English in the countryside. Not quite. Ernest Gimpel was born in 1913 in France. His father, René Gimpel, was a renowned French art dealer. His mother, Florence Duveen was part of English aristocracy, and sister of influential art dealer Sir Joseph Duveen. Ernest had two brothers: Peter, two years his junior, and Jean, five years younger. The three brothers were brought up in cultured affluence in a house in the Bois-de-Boulogne, on the west side of Paris, with many servants. Nothing had prepared the Gimpel men to what was to follow. René Gimpel, arrested twice, would eventually be taken to the Neuengamme concentration camp and died on 3 January 1945. His three sons became involved in resisting the Nazis: one in the British Army, one in the interior Resistance and one with the Free French and SOE, Ernest. A prisoner of war when the Nazis entered Niort, he was helped to escape on 3 August 1940. He worked at Vichy until the end of October 1940, when an army friend, Pierre Henneguier (met at Dunkirk, who later formed the maquis JULIEN), invited him to Marseille to work as co-director of a small firm, Azur Transports. His brother Jean was already working for the company, which operated from 40, rue St Bazile. It was in fact a cover for providing intelligence to a Polish network, F2, working with MI6. Their father, then based in Cannes, was also working for this early resistance group. Ernest’s role was to discover intelligence about any Marseille factories under German control, as well as any other information he could gather from businesses which the Azur Transports lorries visited. Throughout 1941, Ernest continued to live and work in Marseille. But on 25 October, he was arrested by the police and imprisoned at the Fort Saint Nicolas [see here]. He was charged with “atteinte à la sûreté extérieure de l’Etat”, or betrayal of national security. He was taken each day to the Villa Fantaisie where he was interrogated. This lasted a week. He was not tortured and believed that the police had received orders from Vichy to treat him well. On 27 December 1941, a prisoner set up an ambush and facilitated the escape of nine prisoners. Ernest knocked out a guard for which the authorities tried to hold him accountable after the war! From Marseille he went in slow stages along the Riviera and was arrested again in St Raphaël; he escaped again. He remained hidden near Chamonix for 5 months from where he did some intelligence work for MI6. His brother organised his departure for England through the organisation; he eventually embarked in the night of 1 September at Cannes, arriving at Gibraltar on 9 September from where he was flown to Hendon on 28 September 1942. On his arrival, he was questioned by MI6 and gave as many useful pieces of intelligence as he could. The Polish officer who accompanied Gimpel to England reported that he was a highly esteemed agent, who never accepted payment for the work he did as he had “plenty of money” and was an excellent type. 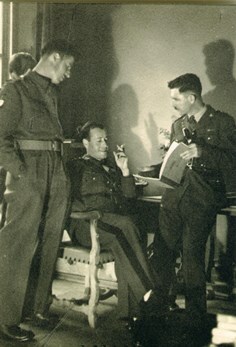 Gimpel responded well to the British interrogations, reinforcing the overall positive opinion of him. Initially he did not want to have anything to do with the Free French, keen to remain in the British service. However he joined de Gaulle’s organisation on 27 November; by 1 December he was on the BCRA’s books, ready to be trained to go back to France on a secret mission. In August 1943, he received a Grade A in his paramilitary training, showing a good standard in use of weapons, a quick and aggressive approach to close combat, and very good knowledge (in theory and practice) of explosives and demolitions. Physically very strong, he averaged 90% in many of his examinations and strained himself hard, showing stamina and agility despite an old wound in his foot. The only area in need of improvement was his shooting. As the name Gimpel was too well-known, or his connection to British aristocracy, he took the nom de guerre of Charles Beauchamp. He would use the christian name Charles for the rest of his life, becoming Charles Gimpel to everybody. He was parachuted into France on 25 November 1943. His false papers were in the name of Charles Henri Blanc, civil servant, domiciled in Vichy. The reality was that he was joining the Military Delegate (DMR) to the Paris region, André Boulloche (codename SEGMENT) to be his deputy. Their job was to liaise with the local resistance leaders, coordinate and facilitate their actions by distributing British arms and materiel. Their mission was halted when, on 12 January 1944, Gimpel and Boulloche were arrested. The latter was wounded and was sent first to a hospital. In spite of horrific torture, Gimpel did not speak to his captors. He was kept at the prison in Compiègne for two months, then sent to Buchenwald concentration camp, then Auschwitz, then Flossenburg. Once again, Charles Gimpel had changed identity: he was camp inmate number 185663. He survived his ordeal and was liberated on 24 April 1945 by the advancing allied troops and repatriated to France. 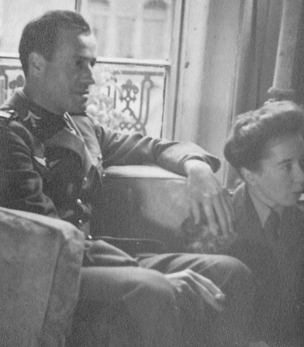 On arriving in Paris, gaunt and emaciated, his first thought was “Where is Kay Moore?” She was not far actually: she had been sent to France with a contingent of Allied personnel. Down to skin and bones, a wreck of a man, he was taken in hand by Kay, herself supported by her RF friends who were shocked by the sight of him and by Kay’s pain. In London Charles was reunited with his brother Peter and in November 1946 they founded an art gallery named Gimpel Fils in honour of their father. Although both brothers were trained in the old masters, their gallery spearheaded the market for modern and contemporary British art by promoting emerging young artists. Kay was the queen of networking, armed with her rolodex. Kay never lost touch with her Canadian roots, and it was through her that Charles became interested in the Arctic. In 1953, to honour the coronation of Queen Elizabeth II, the Gimpel Fils art gallery hung the first show of Inuit art in London. Gimpel, despite being awarded the cross of the Ordre de la Libération, is not mentioned in most books on the resistance, whether the Dictionnaire de la résistance or SOE in France. The DMRs’ work has been airbrushed from resistance history and is just beginning to resurface. Charles died prematurely, aged 59; Kay carried on at the gallery until her later years. Kay welcomed me at her home several times. By then she was 93, frail and ill, but she still had witty repartee, unexpectedly switched between English and French, and vividly remembered her colleagues and friends; she actually enjoyed reminiscing about her war. It felt like losing a friend when she died on 19 March 2009. The memories that she shared helped in getting a sense of 1 Dorset Square as it was during these extraordinary war years, alive and intense, and in a way that no book had or ever could fully describe. She was very happy that her story and that of Charles would be told at the very place where their life’s biggest adventure had started. She also liked the title that would be given to their and their friends' story, RF is For Real Friends. Note: This is an edited extract of the forthcoming RF is for Real Friends, research enlivened with testimonies and unpublished texts. You are welcome to quote any of the above and it will be appreciated if you would kindly acknowledge this research and include a link to this page. © CH 2013. Sources, The National Archives (Kay and Charles’ SOE files), Anne Madden’s website for Le Brocquy’s quote. Photos, Gimpel.